Jarcho-Levin syndrome is an eponym that represents a spectrum of short-trunk skeletal dysplasias with variable involvement of the vertebrae and ribs. Other abnormalities have also been described in Jarcho-Levin syndrome, including neural tube defects, Arnold- Chiari malformation More Details, renal/urinary tract abnormalities, hydrocephalus, hydroureteronephrosis, and meningomyelocoele. ,, Malformations of the spinal cord with a separation into two hemicords have been termed "diastematomyelia." Only four cases of Jarcho-Levin syndrome with diastematomyelia have been reported in the literature. We report the fifth case of Jarcho-Levin syndrome with diastematomyelia. A one-and-half-year-old male child born of full-term normal delivery after a nonconsanguineous marriage was brought by his mother with complaints of progressively increasing weakness in lower limbs with inability to stand since 1 month. On examination, the child was found to be conscious, alert, and active. Neurological examination revealed grade 4 power in the left lower limb. Local examination revealed a lipomatous swelling in the lumbar region. The patient also had a congenital groove at the left costal margin which was not investigated at birth. 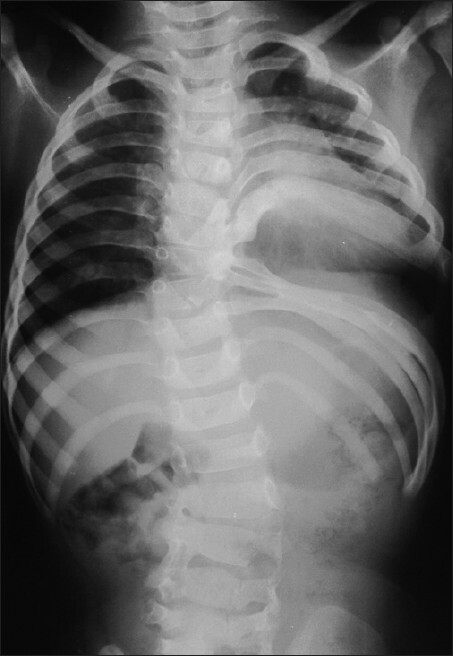 Chest x0 -ray revealed irregular fusion of left sided ribs and scoliosis of thoracolumbar spine [Figure 1]. Magnetic resonance imaging and computerized tomography of the spine were done which revealed spina bifida defect at multiple levels in lumbosacral region. There was evidence of diastematomyelia with a large intraspinal bony bar at L2-L3 vertebral level. 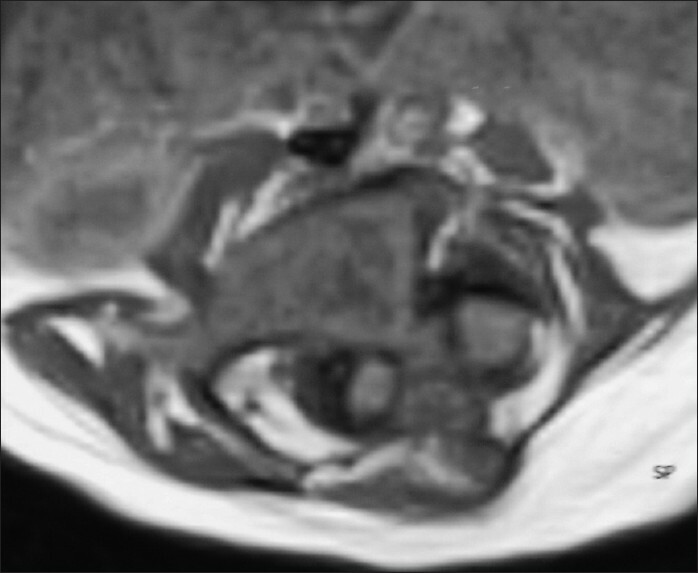 The two hemicords were asymmetric; left smaller than right and each hemicord was seen in a separate dural sac [Figure 2] and [Figure 3]. Tip of conus medullaris was low in position at L4 vertebral level. The patient underwent L1 to L3 laminectomy. A large bony spur was identified on the left side which was dividing the spinal canal into two parts. Two dural sacs were identified which were separated by the bony spur. The right dural tube was larger than the left. The spur was excised with microrongeurs till it was flush with the vertebral body. The dura was then opened and the two hemicords were converted into one sac. The patient had no added neurological deficit postoperatively. The patient has been on follow-up since the last 3 years, but remains unable to walk without support. Jarcho-Levin syndrome is characterized by a short and rigid neck, short thorax, protuberant abdomen, and inguinal and umbilical hernias. Vertebral and rib malformations are the major features. They present with multiple vertebral anomalies at different levels of the spine, including "butterfly vertebrae," hemivertebrae, and fused hypoplastic vertebrae. Reported findings associated with Jarcho-Levin syndrome include congenital heart defects, abdominal wall malformations, genitourinary malformations, upper limb anomalies, neural tube defects and congenital diaphragmatic hernia. Radiologically, the "crab-like" appearance of the thoracic cage on AP projection is characteristic of STD. The prognosis is directly related to respiratory complications. 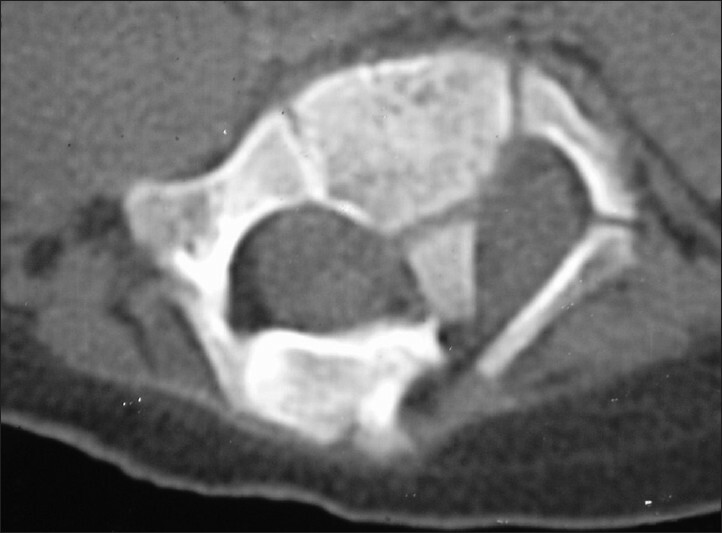 Physicians and surgeons must be aware that spondylocostal dysplasia may be associated with diastematomyelia or other surgically correctable occult intraspinal anomalies which may be diagnosed in asymptomatic stage by magnetic resonance image screening of spine, because late diagnosis might have unsatisfactory outcome. 1. Kulkarni ML, Navaz SR, Vani HN, Manjunath KS, Matani D. Jarcho-Levin syndrome. Indian J Pediatr 2006;73:245-7. 2. Reyes MG, Morales A, Harris V, Barreta TM, Goldbarg H. Neural defects in Jarcho-Levin syndrome. J Child Neurol 1989;4:51-4. 4. Solomon L, Jimenez RB, Reiner L. Spondylothoracic dysostosis: Report of two cases and review of the literature. Arch Pathol Lab Med 1978;102:201-5. 5. Dias MS, Walker ML. The embryogenesis of complex dysraphic malformations: A disorder of gastrulation? Pediatr Neurosurg 1992;18:229-53. 6. Onay OS, Kinik ST, Otgün Y, Arda IS, Varan B. Jarcho-Levin syndrome presenting with diaphragmatic hernia. Eur J Pediatr Surg 2008;18:272-4. 7. Dane B, Dane C, Aksoy F, Cetin A, Yayla M. Jarcho-Levin syndrome presenting as neural tube defect: Report of four cases and pitfalls of diagnosis. Fetal Diagn Ther 2007;22:416-9. 8. Etus V, Ceylan S, Ceylan S. Association of spondylocostal dysostosis and type I split cord malformation. Neurol Sci 2003;24:134-7. 9. Giacoia GP, Say B. Spondylocostal dysplasia and neural tube defects. J Med Genet 1991;28:51-3. 10. Campbell RM Jr. Jarcho-Levin syndrome. In: NORD Guide to Rare Disorders. The National Organization for Rare Disorders. Philadelphia: Lippincott Williams and Wilkins; 2003. p. 207-8. 11. Karnes PS, Day D, Berry SA, Pierpont ME. Jarcho-Levin syndrome: Four new cases and classification of subtypes. Am J Med Genet 1991;40:264-70. 12. Pang D, Dias MS, Ahab-Barmada M. Split cord malformation. Part I: A unified theory of embryogenesis for double spinal cord malformations. Neurosurgery 1992;31:451-80. 13. Elier JL, Morton JM. Bizarre deformities in offspring of user of lysergic acid diethylamide. N Engl J Med 1976;283:395-7. Kutuk, M.S. and Ozgun, M.T. and Tas, M. and Poyrazoglu, H.G. and Yikilmaz, A.